The Ship Owners Association of Nigeria (SOAN) has lamented the effects of the sharp decline in price of crude oil in the international market. Many crude oil exporting nations including Nigeria have in the last one year been struggling with a gradual and consistent fall in the price of the crude oil from over $120 per barrel to less than $40 per barrel, which is yet unstable. The SOAN President, Engr. Greg Ogbeifun, who spoke in an interview, said that more than 95 per cent of shipping activities that the Nigerian ship owners engaged in revolved around the oil and gas activities. This covers both the upstream and downstream of the petroleum. Ogbeifun said that with the concentration of shipping activities on the oil and gas sector, the sharp decline in the price of crude oil naturally brought about a drastic reduction in the level of activities in both the upstream and downstream segments of the industry, thereby adversely affecting the shipping component. He said: “Shipping activities in Nigeria have been restricted to the upstream and downstream segments of the oil and gas sector because the International Oil Companies are only ship charterers. “So the dwindling fortune of the industry occasioned by the decline in the crude oil price is currently taking its toll on the Nigerian ship owners, and so we are operating on the skin of our bodies. "In the light of this fact, shipping activities in the country are still at a zero level because everything revolves around the oil and gas activities. “Therefore, what affects the oil and gas activities affects the shipping activities, which is not good enough, especially given the huge size of the nation’s market and also being an import-dependent country,” he said. Ogbeifun said that Nigerian ship owners must now brace up to diversifying their operations, especially since the present government is also considering de-emphasizing oil and gas as the only revenue earner for the national economy by promoting non-oil exports. He observed that indigenous shipping companies should begin to think in the direction of participating in container shipping business, especially within the coastal and inland waters, which is also in tandem with the intent of the Coastal and Inland Shipping Cabotage policy. He suggested that Nigerian ship owners should begin to think in the direction of acquiring or going into bareboat charter of feeder vessels that would takeover containers and other bulk cargo brought into Lagos, but meant for ports such as Port Harcourt, Onne and Calabar by the likes of Maersk Line. He, however, suggested that the Federal Government and some of its agencies such as the Nigerian Shippers Council should make the negotiations with these multinational shipping line that freight container cargo meant for places like Onitsha, Aba and other Eastern states to the nearest seaports. 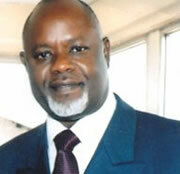 Ogbeifun, who doubles as CEO of the Starz Group, an indigenous shipping line and operators of the Starz shipbuilding yard based in Port Harcourt, Rivers State, argued that this would reduce the pressure on the nation’s roads as well as the worsening carnage through which many have died and goods worth several billions of naira lost in the process.